Summary: Hoarding disorder is a common yet under-recognized condition that can cause significant problems. While collecting things is a human trait, in some individuals it becomes an extreme, to the point where it causes significant stress to the hoarder and to family and friends. At the extreme of consequences, hoarding behaviours can lead to death, e.g. one quarter of preventable fires are due to homes which have become full of hoarded, (flammable) possessions and materials. Treatment can help improve the quality of life of the patient, and allow him/her to stay at home. Interventions include counseling and interdisciplinary care. There are no medications per se for hoarding behavior per se, however if there are associated conditions such as depression, anxiety, OCD, then treating these may help alleviate hoarding behaviours. Harmful effects—emotional, physical, social, financial, and even legal—for the person suffering from the disorder and family members. While the individual that is hoarding may not be concerned about their hoarding, the hoarding can be very concerning to others, such as family members, or landlords. In hoarding, the quantity of their collected items is much greater than in collecting; hoarders accumulate a large number of possessions that often fill up or clutter active living areas of the home or workplace to the extent that those areas can no longer be used normally. Note that although it is underrecognized, it does occur at twice the rate of obsessive-compulsive disorder (OCD) (2%) and at almost 4 times the rate of bipolar disorder and schizophrenia (Pertusa, 2010). Individuals with pathologic hoarding do not usually voluntarily seek help from a physician. Many times, it may be other family members that report concerns to the family physician. In elderly patients with pathologic hoarding, it is often through an event such as a fall or fire that they come to the attention of family members, neighbours and professionals. Do you tend to keep things that others would get rid of? Do you have problems getting rid of things? Does this cause problems at home? For example, are you unable to use any rooms because they are full of stuff? Does it cause problems with other family members? Do you tend to collect free things? Do you tend to buy more things than you can use or afford? Are the living conditions unsanitary or unclean such that they pose a risk to health? Are there other people affected in the home, e.g. children, elderly? Are there animals in the home? The difficulty discarding possessions results in the accumulation of possessions that congest and clutter active living areas and substantially compromises their intended use. If living areas are uncluttered, it is only because of the interventions of third parties (e.g., family members, cleaners, or the authorities). The hoarding causes clinically significant distress or impairment in social, occupational, or other important areas of functioning (including maintaining a safe environment safe for oneself or others). The hoarding is not attributable to another medical condition (e.g., brain unjury, cerebrovascular disease, Prader-Willi syndrome). The hoarding is not better explained by the symptoms of another mental disorder (e.g., obsessions in obsessive-compulsive disorder (OCD), decreased energy in major depressive disorder, etc.). In the DSM-IV, hoarding was not recognized as a distinct disorder, but rather as a symptom that could occur in conditions such as obsessive compulsive disorder (OCD). Now however, it is realized that hoarding disorder has its own particular symptoms, prognosis and treatment course, which is why it is recognized as a separate condition in the DSM-5. Hoarding of objects comprises a continuum from normality to extreme disease. The hoarding behavior may in fact be normal, if it is not causing any impairment. Many people enjoy collecting comics, hockey cards, coins and stamps. Collecting is a normal phenomenon, where the goal is to organize and enjoy a series of objects. 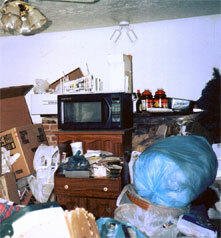 Hoarding (along with self-neglect) can be secondary to depression. Treating the depression then leads to improvement of the hoarding behaviours. Brain injuries can lead to cognitive issues that can then lead to hoarding behaviours. Individuals with substance use may neglect personal care as well as their surroundings, and may thus appear to have hoarding. Individuals with schizophrenia can have hoarding behaviours. Physical exam is useful to rule out other medical conditions that may contribute to the hoarding behavior, such as dementia. There are no pathognomonic tests to diagnose hoarding disorder, however laboratory investigations may be helpful to rule out associated medical conditions. Are there children at risk? Contact child welfare agencies such as Children’s Aid Society (CAS), etc. In most cases of hoarding, specialized supports from mental health professionals and/or specialized hoarding resources are required. Depending on the community, the local public health department may offer services, or help with navigating services. Hoarding is a public health issue, because due to the increased of fires, insect and rodent infestation, it affects more than just the individual with hoarding. There may be mental health professionals in the community that have expertise with hoarding, which may include social workers, counsellors and psychologists. Although there are many services which purport to help with hoarding, if at all possible, it is best to choose a professional that belongs to a professionally regulated profession, e.g. social work, nursing, psychology, etc. Frost R, Steketee G, Tolin DF: Comorbidity in hoarding disorder, Depress Anxiety. 2011 Oct 3;28(10):876-84. doi: 10.1002/da.20861. Epub 2011 Jul 18. Pertusa A, Frost RO, Fullana MA, et al. Refining the diagnostic boundaries of compulsive hoarding: a critical review. Clin Psychol Rev. 2010;30:371-386. Produced By Tolin et al.